Travel through God's Word all year long! The greatest stories in the Bible come alive for kids in My Bible Adventure Through God's Word. Watch your children develop a relationship with God while reading amazing stories of faith. Written by pastors, children's ministers, and leaders who have a heart for helping children become lifelong believers, My Bible Adventure Through God's Word is a perfect tool for introducing your children to weekly devotions. Cute art and simple storytelling naturally lend themselves to early readers who are starting to read on their own. 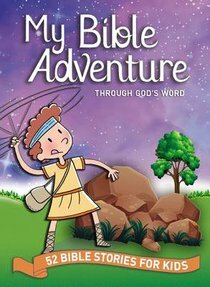 With tangible takeaways and prayers at the end of every Bible adventure, your children or grandchildren will grow in their faith as they read My Bible Adventure Through God's Word. Help your child engage his or her faith in new, meaningful ways through the wisdom and insight in My Bible Adventure Through God's Word. By starting the habit of studying the Bible at a young age, your young believer is signing up for the adventure of a lifetime! About "My Bible Adventure Through God's Word"